Published: Sunday, June 9, 2013 at 5:30 a.m.
Last Modified: Sunday, June 9, 2013 at 3:21 p.m.
DAYTONA BEACH — Bringing big hotel and retail developments to the beachfront used to take a big taxpayer investment. And that money was supposed to accomplish big goals: revive the beachside, attract tourists with more money to burn and draw conventions to the Ocean Center. Those goals are still there today — as big as ever — but one thing has gotten smaller: the amount of taxpayer money hotel developers are asking for. “(Hotel developers) are able to come in and make their numbers work without having to talk about 10, 20 or 30 million in public subsidies,” said Daytona Beach Deputy City Manager Paul McKitrick. 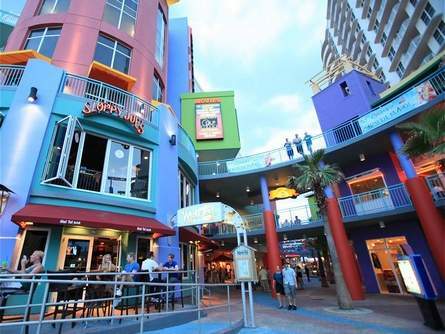 From the mid-1980s through the early 2000s, the city and county dished out more than $35 million in community redevelopment money — $50 million-plus in inflation-adjusted dollars — to help build and expand what is now the Hilton Daytona Beach Oceanfront Resort and the Ocean Walk retail, time-share and condo-hotel complex. Fast-forward to today, and the purse strings are tighter, with the city offering less — many millions less — to the beachfront’s two newest proposed developments, the Hard Rock Hotel and the 300-500-room convention hotel-and-condo complex backed by Russian investors, though local and national observers note the companies could seek more help as construction gets under way. So, what changed over the past quarter century? In the mid-1980s, when the city OK’d the first of the roughly $15 million that would go toward the Daytona Beach Marriott — now the Hilton — the beachside was seedy, its hotels were dated and the Boardwalk was a magnet for unsavory characters. “It was in every way a blighted area,” McKitrick said, adding that the city then was more willing than it is now to build with public funds in the absence of private investment. Despite the city shelling out for the Marriott — which went into bankruptcy in 1994 and was rebranded as an Adam’s Mark — and the county spending $39 million to build the Ocean Center, the beachside fell into a similar situation in the late-1990s. Again, the city dipped into community redevelopment area (CRA) funds — this time to the tune of about $19 million — to help build the Ocean Walk Shoppes and its accompanying time-share and condo-hotel complex. The city later refinanced the bonds used to pay for the Hilton and Ocean Walk projects, taking on $37.7 million in debt initially, to be paid back by 2031. Today, the Hard Rock developers and Protogroup — for now, at least — are only looking for a fraction of that, enough to improve the surrounding infrastructure and landscaping to support the developments. Though the city is still eager to attract another convention hotel — in part to complement the Ocean Center, which completed an $82 million renovation in 2009 — and it still wants to revitalize the beachside, McKitrick said it’s looking to spend less in CRA funds. And thanks to market changes, building on the beachfront makes sense today even with less government support, said Henry Wolfond, chairman and CEO of Bayshore Capital Inc., the Toronto company that is developing the 250-room Hard Rock Hotel south of Sun Splash Park on State Road A1A. “The opportunity to acquire property at fair prices in the past few years contributes to the viability of moving forward with less incentive from local governments than in the days when Hilton and Ocean Walk were built,” Wolfond said. A state tourism industry that has recently been on the rebound and the existence of the old taxpayer-funded developments — the Ocean Center, Ocean Walk and Hilton — don’t hurt, either, he said. Rather than asking for money to help build portions of the Hard Rock hotel, condominium and restaurant complex itself, Bayshore is negotiating with city officials to get help upgrading infrastructure so it can support the new facility, said attorney Glenn Storch, who represents the company locally. Storch wouldn’t disclose how much the company is seeking, but said it would be substantially less than the amount that went to the Hilton and Ocean Walk. “If not for these incentives, (the Hard Rock) would not be built,” he said. Similarly, the city so far has only offered to reimburse Protogroup’s impact fees and separately reimburse the company up to $450,000 with CRA money to fix up the Oakridge Boulevard beach approach, which the firm’s hotel-and-condominium complex will straddle, with improvements like lights, landscaping and signage. DeLand attorney Mark Watts, who represents Protogroup, estimates the company will save about $1 million from the fee reimbursements. More than simple economic changes are keeping a lid on taxpayer aid to the new hotels, at least for now. The projects themselves are different from the Hilton and Ocean Walk and, consequently, aren’t eligible for as much help, city officials and developer representatives say. The Protogroup project and the Hard Rock will be built in community redevelopment areas, special taxing districts created by the county to revitalize neighborhoods it deems blighted. And while the Hard Rock will be built entirely in the South Atlantic CRA, only the southernmost building of the two-tower Protogroup development will stand in the Main Street redevelopment area, which was created in 1982 and is the county’s oldest CRA. Consequently, that limits the amount of CRA money that can go to the Protogroup project, Berger said. Additionally, unlike the Hilton and Ocean Walk developers, Protogroup didn’t seek help for the complex’s interior, Watts said. The company doesn’t need help for the kind of common areas — including banquet rooms, passageways and lobbies — to which state law allows CRA money to go, he said. Watts added the Protogroup is still in talks with the city, county and the Florida Department of Transportation, which maintains A1A, about making additional upgrades to the neighborhood — including resurfacing Oakridge Boulevard from the beach approach to the Halifax River bridge. That could mean more public money going to the Protogroup, Watts said, but the funds would be spent off-site, not on the resort itself. Ultimately, the city would like to get the beachside improved to a point where fewer incentives would have to be used to attract new development, McKitrick said. But things are currently going in the wrong direction, and CRA-funded projects have done nothing to help, said local radio talk show host and former Volusia County Councilman Big John, who served on the council when the Marriott, Hilton and Ocean Walk incentives were approved by Daytona Beach. “It’s getting worser and worser,” Big John said, adding that factors other than developer-friendly economic conditions have led the city to tighten the CRA spending for the new developments. Regardless of why it’s happening, the apparent shift away from public incentives in Daytona Beach is bucking a national trend, said Bob Sonnenblick, chair of Los Angeles-based real estate development firm Sonnenblick Development. Indeed, the Sioux City, Iowa, City Council approved financing $22 million and closing a downtown street to help develop a Hard Rock Hotel & Casino. A study drafted last year by Orlando research firm Fishkind & Associates for the CEO Business Alliance, the county’s private economic development group, suggested the city and county offer tax-funded guarantees on financing for a new $130 million, 500-room convention hotel on the beachfront. Neither the city nor the county acted on the report’s recommendations. And Sonnenblick said he isn’t sure Protogroup and Bayshore won’t ask for more than they seek initially. However, industry watcher Daniel Lesser, president and CEO of LW Hospitality Advisors in New York City, offered a counter view, saying there is no discernable national trend in how much public assistance hotel developers seek.